Tyrod Taylor is 50-50 out this week. We're all thinking Nathan Peterman, right? What if it's Joe Webb? The Bills are still very much in the playoffs. The game with the Colts is very winnable. Webb is an experience runner-thrower QB who could bring a whole new, weird dynamic...the Bills could run the wishbone of some kinds in a sense...run 50+ times with RBs and Webb. Did you know before Tyrod got hurt, Webb was coming in and running a few plays to mix things up last week...3 runs, and a pass that shocked the Pats, a guy was wide-open and Webb overthrew by a foot for a TD/the early lead. 4pts per pass TD...you're in a deep roster league with issues at QB or a 'superflex'/2 QB league and hate your #2 QB (and #3 QB)...I'll tell you what -- Webb against the Colts for a game...10+ carries for 50+ yards rushing and maybe a TD? and will hit some passes because teams are so sucked in on the run. Marquise Goodwin or Trent Taylor as a use now and/or for dynasty stash...? This particular week, I'd go Goodwin over Taylor. Taylor will be like a 4-8 catch, 40-80 yards, no TDs option...Goodwin could easily drop a 5-150-1 line. I don't think his downside is too limited either. If one of them is going to have 100+ yards and/or a TD it's probably Goodwin. Dynasty...Trent Taylor is Garoppolo's 'Edelman' and Goodwin could get lost in a shuffle as the third/fourth most important option -- a lightning strike guy that JG will love to have but becomes more Ted Ginn than Tyreek Hill. 2:58pmET: Should you cash out on Josh Gordon this week in dynasty leagues? I get that you want to. Many have held this stock for years...either you had it soar to $100 and then fall to $1, so you kept it 'just because'...and now it's worth something again. Or you bought it for $1 and now you might make $25-50 on it. Either way, you're hyper aware -- this stock could go back to $1 like that (snaps finger vigorously). Take a profit or try to ride it up more (and get burned again, as the past dictates)? I think people are still 'cool' on Gordon. They believe he is a #1 stud WR in potential, but most people in FF have been burned here. He's been passed around like a hot potato for years of false hopes and comebacks. I think you need to wait a week or two and let him have 'a game' and then consider selling...let people get whipped up into a frenzy again. His general value today...a WR2...#18-30 most favored among WRs and many won't touch him for fear of another burn. His value after a big play/game ahead this season...he rockets to fringe WR1, a #10-15 WR. The media is in the phase of 'look at Gordon, he's back...that's mildly interesting'...like they're bored at the zoo. However, when Gordon has a long TD and 100+ yards, all the hysteria will crank up. There will be all these stories about him turning his life around, etc. Let the media be your friend here. Another quiet game won't change his value downward much, but a good game will light a fuse on him. I think that game is coming this week vs. Green Bay. Wait a week. If I could trade Gordon, who I might off scooped off waivers weeks ago, for injured David Johnson -- I do it in a heartbeat. I want to trade Gordon like the WR1 people want to believe in. 1:21pmET: Thank you for all the emails on your early-season sad sack, 'out of it' team that you stuck by and scratched and clawed your way to the playoffs. I love to read them!! Seriously. Consider...this is all I do all day, every day from August-December. I put aside family events so I can comb over sleeper DST possibilities. We had to reschedule Thanksgiving to a different day because of the football schedule. I take my dog to the dog park every morning, and today I was dictating some of my Lions-Ravens notes into my phone walking around the park, in 20-degree weather...bare hand freezing (because I have to hit buttons to correct some dictation or the dictation cuts out and I have to restart it). I just had to make sure you knew to steer clear of Tion Jones ASAP. So, feel free to drop me a note on your 0-2, 1-3, 1-4, 2-5 miracle playoff teams. I get it -- you can't believe it happened and you thought I was being too 'rose colored glasses' when I extolled to stay the course. Now, you're here in the playoffs (for some this is the week you find out). You can't tell your spouse because they think you're nuts. You can't tell your FF friends because then it's bragging or tipping them to your strategies that they didn't understand all year. Who understands what happened? Uncle R.C. 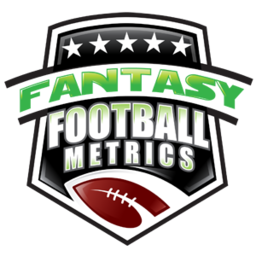 If you just gotta tell someone...rc@fantasyfootballmetrics.com I live for the stories of your success. Makes my day. Keeps me driving to turn over one more stone each hour to try to find the hidden treasure. Thanks!! 12:55pmET: Marcus Peters suspended for a game (just the beginning of issues for him I fear). This is why we had Michael Crabtree up so highly this week...we thought this was coming. Let me get some small taste of OAK +4.0 this week. This draws KC into a for sure shootout...Crabtree, Tyreek, Kelce, Carr, and Alex Smith all going to have nice FF efforts this week. 12:38pmET: People are going to get suckered on Matt Stafford's hand injury by Dak Prescott being fine. Different issues, and Stafford's at a real risk. Marvin Jones and Golden Tate owners have to prepare for the worst. I like Kerwynn Williams, makes a great gallon of paint, and he is a solid RB in a pinch. I didn't think he'd matter this week but based on some Arizona contacts -- AP is not looking good to play this week. No AP = Williams an RB2 hopeful. -- CIN-CHI bettors...I think Cincy could be without 2-3 CBs and 2-3 LBs for this week's game. FYI. After a brutal affair, on a short week...you have to question the mental and physical state of CIN and PIT for this week's games. -- Saw Denver was working out a QB this week. I wonder if they'd like top rethink the Kyle Sloter cutting? The Broncos interviewed Kyle Shanahan before selecting Vance Joseph. Nice. -- The Redskins tried out about a dozen or so players yesterday -- I guess they're thinking towards 2018. No names I saw that interesting.